This lightweight pant is ideal for warmer conditions! Being comfortable in the field will make a good hunt even better when you don't have to worry about product performance. GWG has designed our women's hunting pants with every hunting scenario in mind! Not only do these wind resistant pants have a velcro adjustable waist, but they are adjustable in length as well (inseams 32"-36"). Complete with 6 pockets, you will have plenty of places to carry calls, keys, cell phone, and other must have's. Soft micro tricot lining ensures comfort! 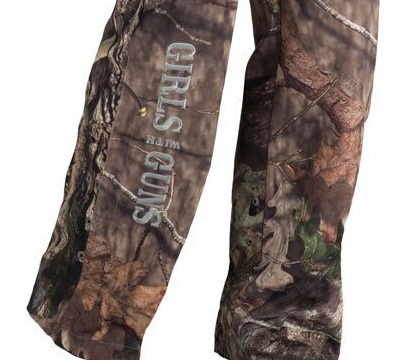 Subtle deer tracks on the back of the leg, GWG Buck logo on the rear belt loop, and Girls with Guns embroidery on the front of the leg make these women's hunting pants fashionable. 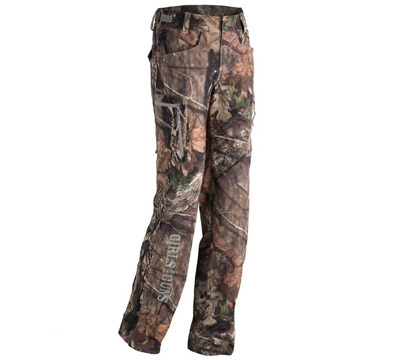 Features include: 95% Polyester 5% Spandex, Wind Resistant, Adjustable Length & Waist, and Mossy Oak® Break-Up Country. Made by Realm Brands, LLC. LIMITED TO STOCK ON HAND. NO BACKORDERS.